Can you believe Thanksgiving is just 25 days away? Are you having a Thanksgiving dinner? I am going to help bring the domestic diva out in you with my simple entertaining ideas for the month of November. I am sharing a simple DIY fall centerpiece today. Happy Fall Y’all!! 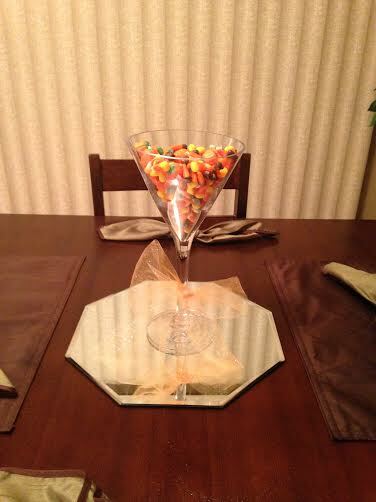 Pour the autumn mix candy in the large martini glass and tie your ribbon or tulle around the glass. So cute and simple! You can give the candy away at the end of your dinner as a favor or treat for your guest.